If you manage a hospital’s neonatal intensive care unit, obstetrics department or a pediatric department, you probably have one overriding worry: the possibility that an infant from your unit might be abducted on your watch, or perhaps mistakenly placed with the wrong mother. Either scenario is catastrophic. 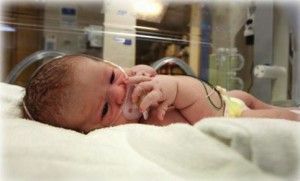 While infant abductions in U.S. hospitals are (thankfully) rare, such incidents do occasionally occur. New mothers can be nervous and unsettled regarding their newborn babies. A new mother who is confident about the safety and security of her newborn is a healthy mother—and a healthy mother, of course, makes for a healthier baby. An infant security platform offers cost-effective, facility-wide protection for all types of patients and assets. An easy-to-use software app results in clinical staff that can spend less time managing a security system, and more time doing what they’re most passionate about: caring for patients. Every infant under the care of your unit will be protected with a small, wearable tag that is both comfortable for the infant and unobtrusive. Your NICU or pediatric department can choose from a variety of tags, including the popular skin sensing ankle-band tags (as shown below) or umbilical attachment tags. Every infant’s tag communicates in real time, around the clock, with the workstation, which displays the monitored areas of the unit and all protected exits. It even offers bed-level location visibility to staff. Should an unauthorized attempt to leave the monitored area with a protected child occur, the system will not only set off a warning alarm and activate door locks, but it will even hold selected elevators, effectively shutting your unit down, floor by floor, in the process. If an infant’s tag stops communicating with the system, or if a tamper event of any sort occurs, an alarm will sound. An alert will also display on your workstation, and the event will be permanently logged into your system’s database at the same time. Click to learn more about our accuracy-based asset tracking and management solutions, which are able to achieve room, bed, bay, and even shelf-level tracking. Contact us today for further information, or with any questions about the CenTrak Security Solution.